For those who are really into preparing their own coffee at home, grinding the beans yourself is definitely a must. In fact, owning a really good coffee grinder is arguably more important than owning a really good coffee maker. Why? Because if something goes wrong at the grinding stage, there’s basically no hope to redeem things at the brewing stage. Sad but true. That means you need to grind with fresh whole beans whenever possible (as opposed to the pre-ground stuff), and use those grinds as soon as possible. By doing this, you will get noticeably richer, better tasting coffee and espresso, regardless of the brewing method you use. 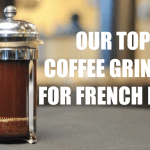 So whether you’re new to home brewing or a seasoned home brew vet, owning the best coffee grinder you can get your hands on is going to make a huge difference in how good your coffee tastes. 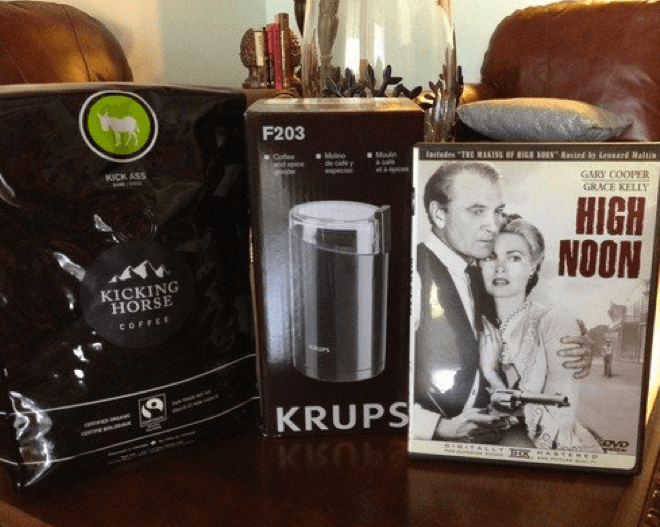 As much as you might want to buy something expensive to start with, not everyone is ready to spend $500 on a new coffee grinder, and even $200 can seem a bit intimidating if you haven’t bought one before. The more expensive grinders on the market do take some getting used to, as they are meant for serious home brew aficionados. If you’re just starting out, you may want to start with something a little bit more cost effective. So, is there anything on the market for someone who would like to give grinding at home a go, but not pay hundreds of dollars? Perhaps something along the lines of $50 or less? Luckily, yes there are, and that’s why we’re here – to show you the 5 best coffee grinders under $50 in 2019. Does grinding your own coffee really makes a big difference? Yes, it does! 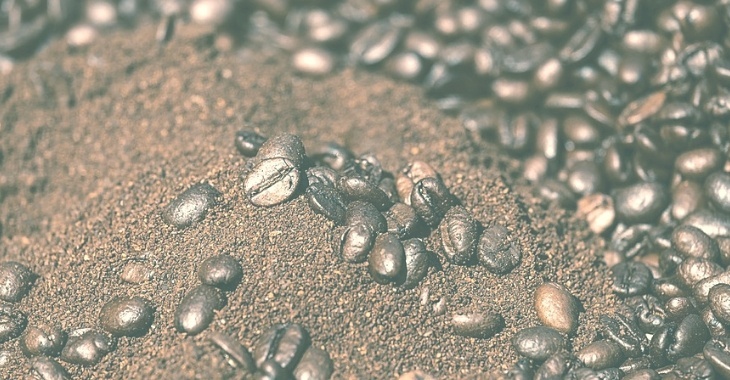 Grinding your own coffee will definitely improve your home brewing process. Any coffee lover will tell you that grinding your own coffee is as important as using fresh water for your coffee. 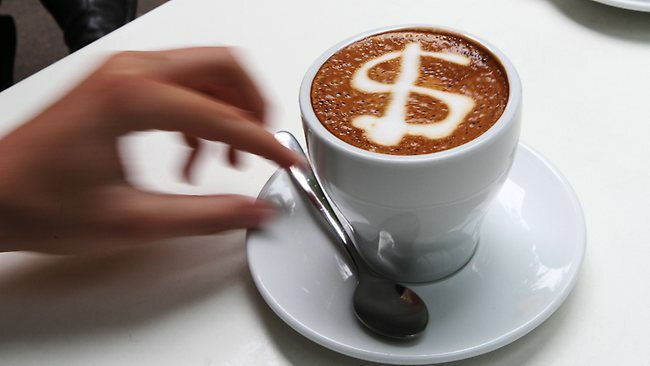 Thanks to the coffee grinder you control how you grind, when you grind, and how much you grind. Coffee beans contain delicate oils and precious flavors and when ground fresh, you gain more control over the process and what you extract from the beans. 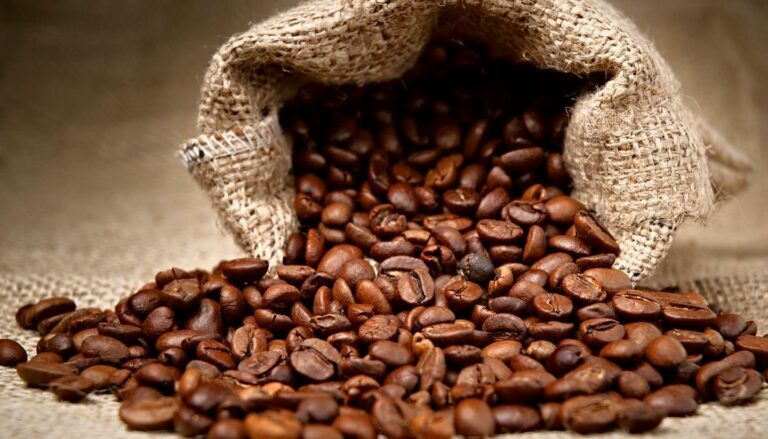 It is believed that people lose up to 60% of the aroma if they purchase pre-ground coffee. It’s worth mentioning the grind determines the richness and strength of the cup base on the coffee machine you use. For a French Press you should always use the coarse grind as it will let you easier push the screen down and will create less sediment in your cup. There you go! Now you understand why you should always grind your own coffee. So if you are not grinding your own coffee already, start doing it as soon as possible and open your world to a greater cup every time! 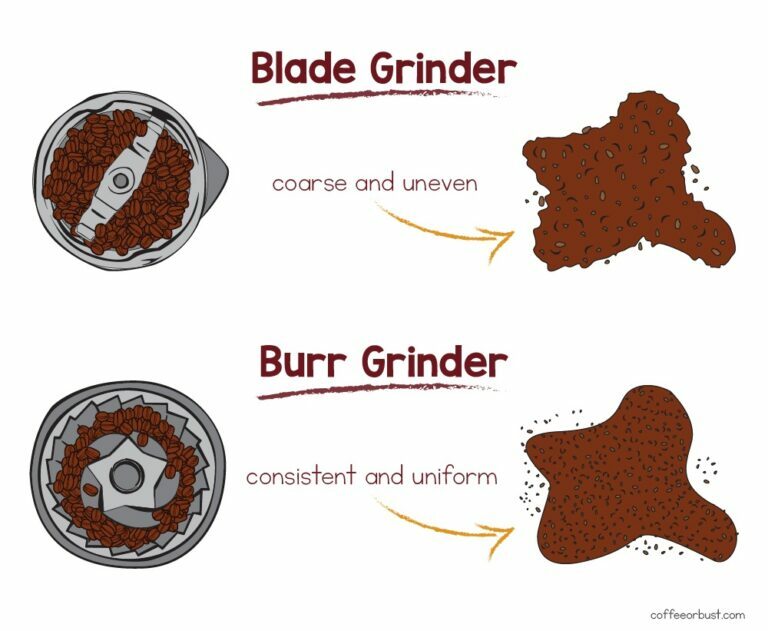 Next, let us discuss about the differences between blade and burr grinders. The type and performance the coffee grinder you use will affect how coffee will taste. Choosing the right coffee grinder is one of the most important steps in the brewing process. 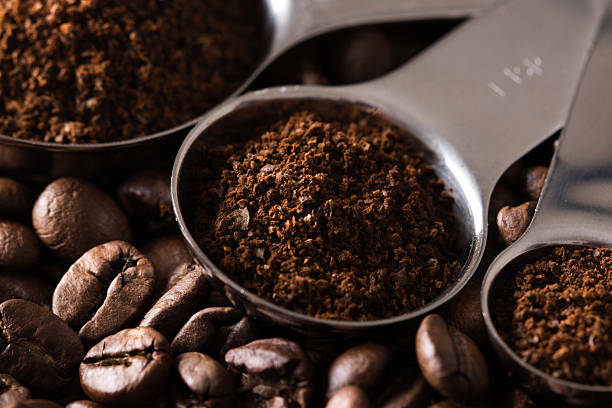 Coffee grinders grind coffee beans in two main ways: with blades, or with burrs. 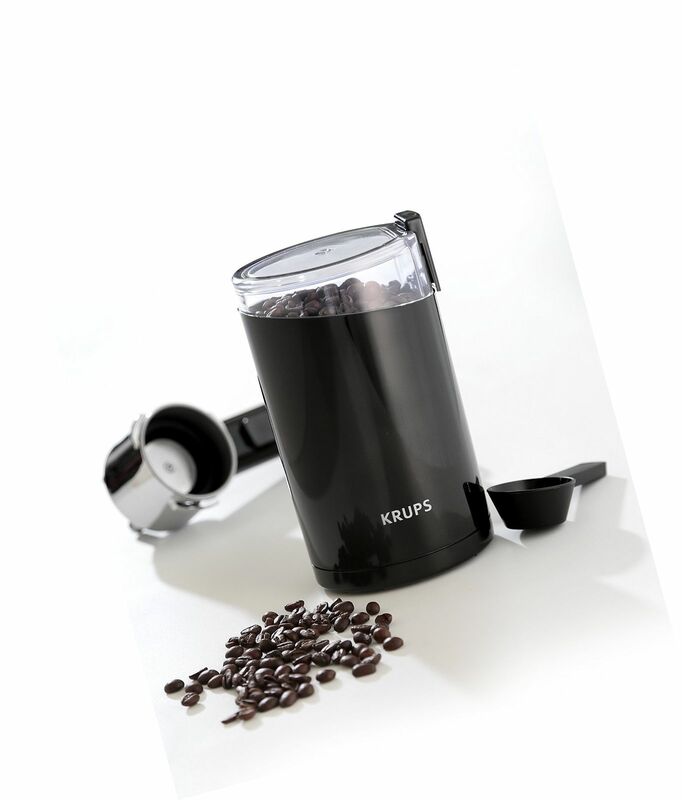 Blade coffee grinders are made up of simple blades that slice and dice the coffee beans in order to grind them. These blades are very similar to those found in blenders. 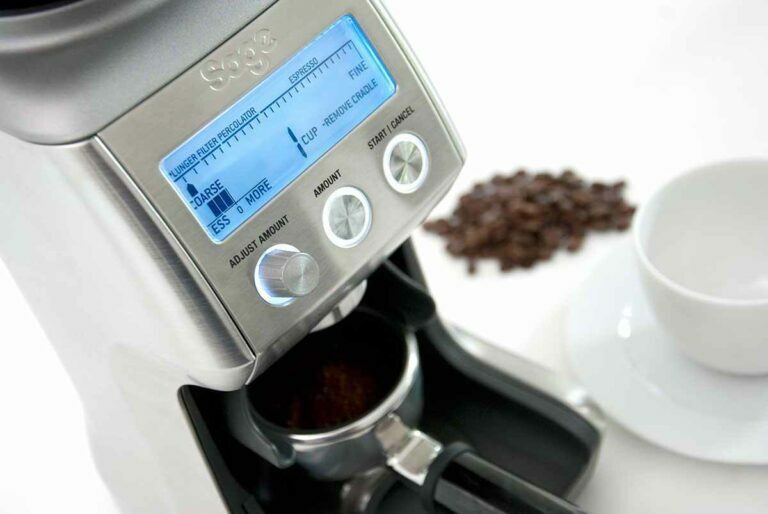 When you turn the grinder on, the blades start rotating at high speeds, mixing and slicing the coffee beans. One problem with blade coffee grinders is that their blades can heat up a lot. The heat from the blades can sometimes burn the coffee, resulting in a burnt taste in your cup. Blade grinders are usually much faster than burr grinders or disc and conical grinders. 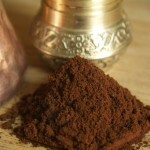 However, the resulting coffee grounds can sometimes be uneven in size, affecting the quality of your coffee. Even if you’re trying to get a course grind, you will get some powder. Unfortunately, blade grinders don’t let you control the grind size. A blade grinder will only let you control how long the machine stays turned on. Burr grinders have two or more burr pieces that funnel coffee beans through the grinding area where the beans get ground. Their design hasn’t changed a lot over the years. Burr grinders are usually much slower than the blade grinders. It can take you up to a minute to grind enough coffee for one cup. However, it is worth mentioning that they produce much more consistent aggregate, and there is no chance of burning the coffee. The size of the grind can be adjusted from very course to powder. 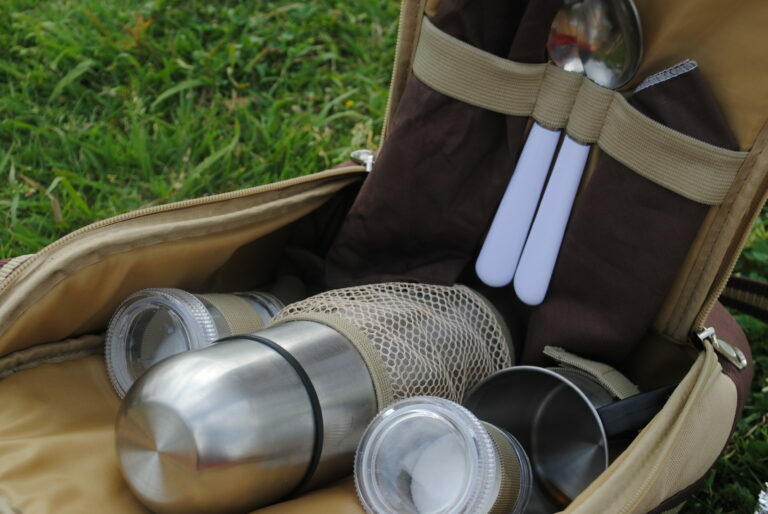 This means you will able to prepare anything from espresso to French press coffee. Most of the burr grinders are powered by electric motors, which takes the effort out and is much faster. Of course, if you prefer grinding your coffee manually you can buy a manual burr grinder. There are two types of burr grinders: flat & conical grinders. Conical grinders are a bit cheaper and quieter, while flat burr grinders cost more but are better at producing consistent particle size. Are manual coffee grinders better than electric? 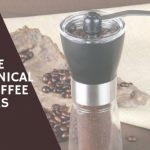 If you are looking to buy a coffee grinder, you are probably asking yourself the same question as countless other coffee lovers who wish to buy their first coffee grinder; should I buy a manual or an electric coffee grinder? No worries, we will help you make the right choice. Let’s explain how they differ and why you should choose one over the other. Manual coffee grinders are usually much smaller than their electric counterparts as they don’t have any electric components. Most can be held with one hand and cranked with the other. Manual coffee grinders are also more durable than their electric counterparts as they are incredibly simple machines. Another cool thing about manual grinders is that you don’t need to spend your precious time understanding the mechanics behind them and learning how to use them. However, this simplicity comes at a price. You will have to use your muscles to grind coffee beans. Although grinding coffee manually isn’t that hard, it can become tiring and boring if you need to grind enough coffee for several cups. Electric coffee grinders can do the job faster than their manual counterparts and can also offer more grind size settings. Some high-end electric grinders have over 40 grind size settings that range anything from espresso to French press. It is also worth mentioning that some electric grinders can dose ground coffee according to weight, saving you your precious time. 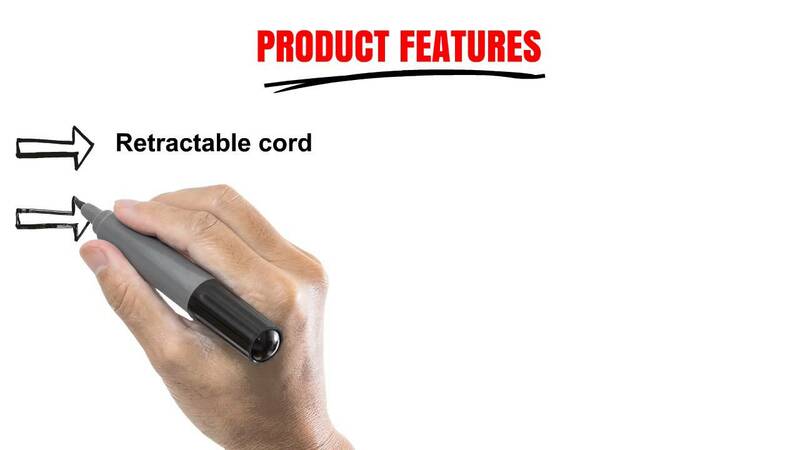 However, as they pack a lot of electric components, they can easily break. Also, they are pretty much useless when there is a power outage. If you are looking for a grinder that can do the job quickly and efficiently grind coffee for various types of coffee, we suggest you buying an electric coffee grinder. However, if you are looking for a cheaper option that will last several years, will work without electricity, and you don’t mind spending few minutes on grinding your coffee manually, then get yourself a manual grinder. Now, let us present you the Top 5 coffee grinders under $50. This Hario coffee mill is generally accepted as one of the best coffee mill-style grinders on the market right now, for a few good reasons. For the roughly 40-ish dollars you’ll pay for this hand crank grinder, the overall quality you’re getting is quite high. 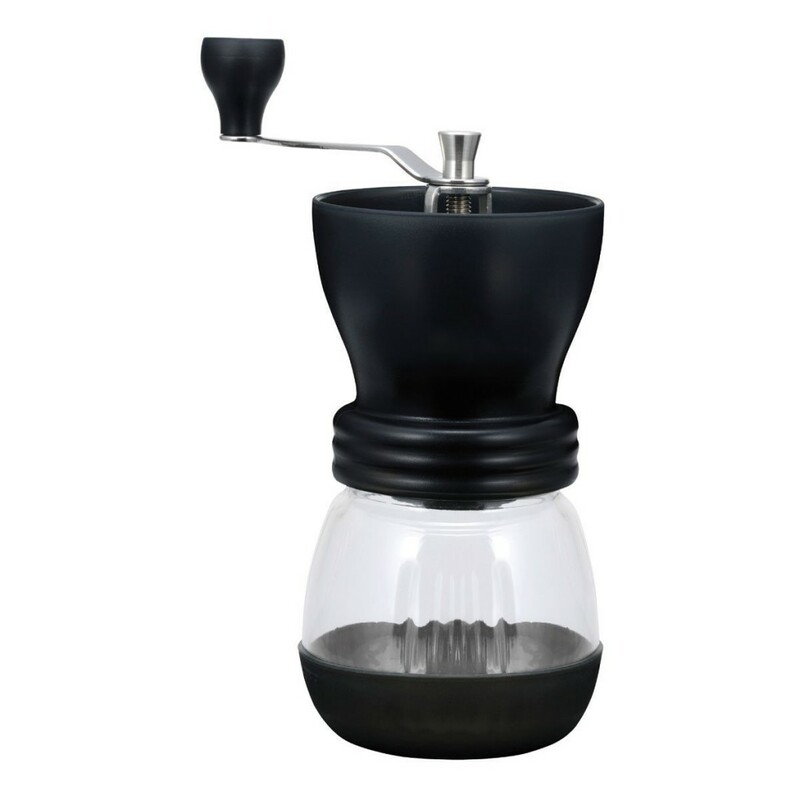 For one, you’re getting a good-sized glass grinds receptacle as only Hario can make, since they’re specialists when it comes to glass products. As you can see from their website, Hario is all about glass and they have many groovy-looking products from their coffee gear to a wide variety of kitchenware. Glass, while it is quite lovely, can also be quite fragile. In the case of the Hario Skerton, one of the potential drawbacks is that it does have a beautiful but breakable grind container. The glass here is relatively durable, but still, extra caution must be exercised with this grinder, because if it falls, its all over. Here is a quick video so you can see the Hario Skerton in action. 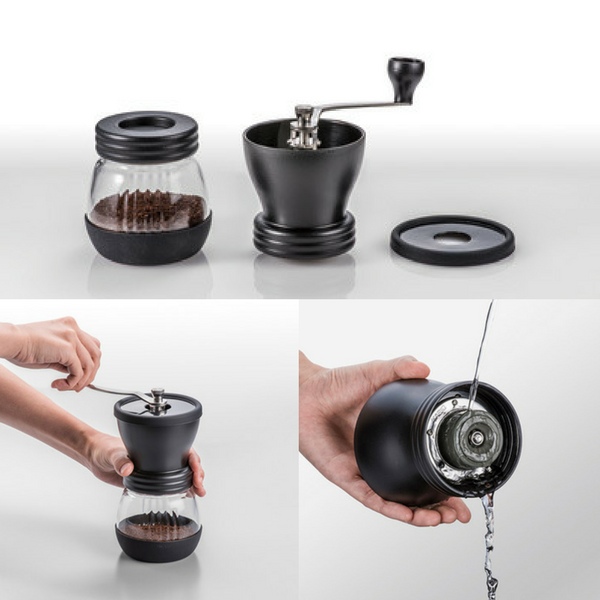 The Hario Skerton is actually a perfect coffee grinder for traveling, based on its size. At 16 x 11 x 13 inches and 1.2 pounds, its light, compact, and requires no electricity to do its job (hence the “manual” part of the description). If you find yourself going somewhere, and still have the desire to make a cup of coffee, then having a grinder like the Hario Skerton by your side can be quite advantageous. Its easy to put together, take apart, and clean. Between the glass and the plastic hopper, there’s really not a lot to the Skerton in terms of complicating factors. You put beans in, close the lid, and adjust your burrs, and grind until you get what you want. As the Skerton is a coffee mill (akin to a pepper mill), you will need to do your bean grinding manually. For some, manual grinding is not the ideal grinding method. It is overall a slower process, but, luckily, the process of manual grinding involves employing burrs, which is the preferred method of grinding coffee by all the pros. 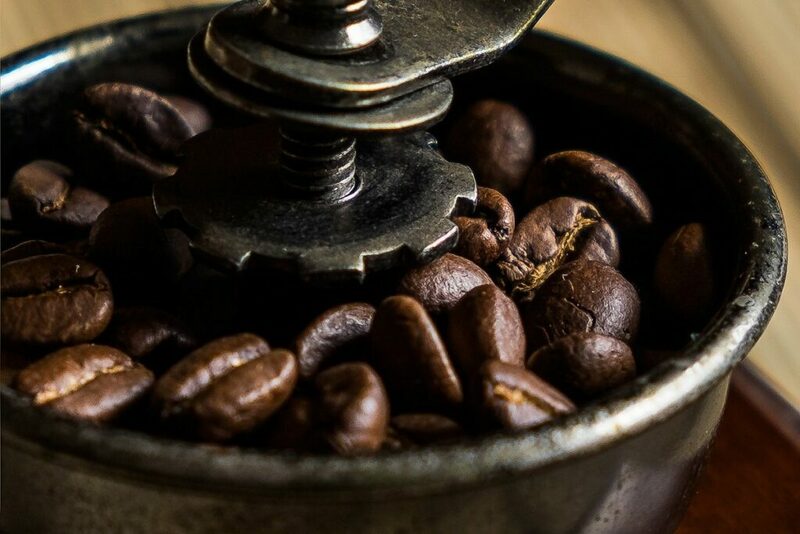 In addition, slow grinding is actually better for your coffee’s flavor, because it preserves some of the vital oils that are part of the bean. So, as it turns out, the slower method of grinding just scientifically provides richer and tastier coffee. The reason being, burr grinding actually mashes up the beans, rather than the slicing that goes on with a blade grinder. In practically any case, a burr grinder beats a blade grinder hands down – except maybe with regards to the price. That said, manual grinding isn’t for everyone, although the reviews on Amazon for the Hario Skerton are generally quite favorable. As we said, there aren’t too many parts to deal with here, but one of the features of the Hario Skerton that we like is the sealed lid that you can use to cover up the grinds receptacle, so that it doubles as an airtight grinds container and allows you to store your grinds and keep them fresh until you’re ready to brew your next cup. One last thing we’ll mention about the Hario Skerton is the fact that it uses an adjustable burr set. As we said, it is a good thing when a grinder uses burrs to grind your coffee, but having them be adjustable is also essential. 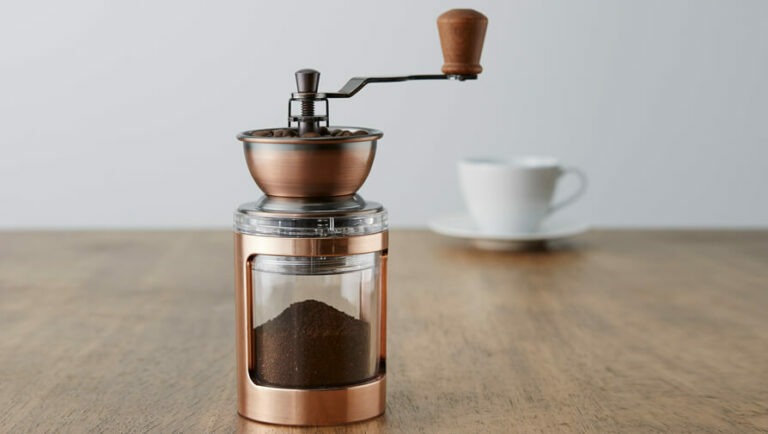 Because the burrs are adjustable, you can grind for a variety of brewing styles, with an emphasis on pour over methods such as the French Press, and drip coffee as the particular specialties of the Hario Skerton. The Skerton is definitely a worthwhile grinder if you enjoy these types of coffee. 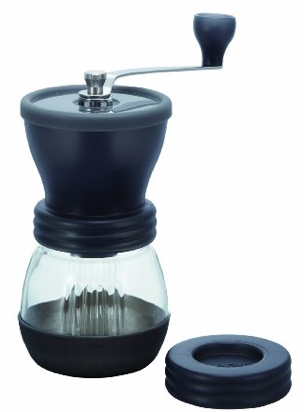 Much in the same style as the Hario Skerton, we have the Kuissential Manual coffee grinder. 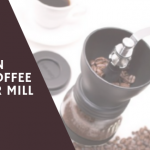 Both are coffee mills, both are reasonably priced, and both are very popular with customers on Amazon, who have rated this coffee mill very highly. It’s difficult to avoid comparing the Kuissential Manual and the Hario Skerton, and so we will go ahead and do so. The one big difference that most people will notice is the price. The Kuissential is slightly cheaper, and its hard to ignore that fact, especially considered that the Hario Skerton and the Kuissential Manual are more or less identical. As we mentioned, much is the same when it comes to the Kuissential Manual as with the Hario Skerton. 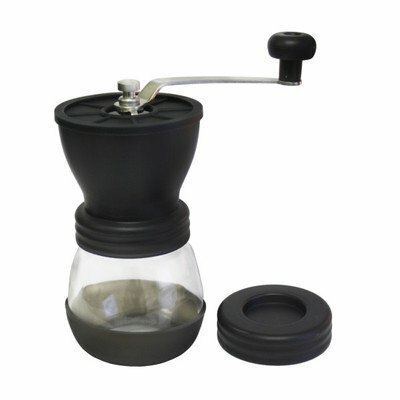 Similarities include having the glass receptacle for collecting the grinds, a plastic hopper with ample space for beans, an adjustable burr set, with a no-slip plastic base, and a metal handle with a black plastic knob at the end. They are also both very quiet grinders, due to having no motor. The similarities don’t stop there. Both the Kuissential and the Hario have ceramic conical burrs, which is the type of burr one would want for their home grinder, and conical burrs are advantageous for grinding, and ceramic is reputed to be the better material than anything made of metal, based on durability and the fact that they stay nice and cool while grinding. Yes, so you can see that if you put the Kuissential Manual coffee mill next to the Hario Skerton, you will be looking at nearly identical twins. There aren’t a whole lot of differences between the Hario and the Kuissential here, but there are a couple. One is that the Hario is a slightly more light weight, at 1.2 pounds, versus the Kuissential’s 1.5 pounds. On top of that, only the Kuissential is advertised to be made from BPA-free materials, while the Hario Skerton makes no such claims. The Kuissential distinguishes itself here with a nice, long handle that is slightly more ergonomic than the Skerton. The angle is a bit different in that it has a slight downturned, and we just think that its just tiny bit easy to turn than the Hario Skerton. When comparing its grind consistency and variability to the Hario Skerton, there is more of a consensus from buyers that the Kuissential can achieve a wider range of fine to coarse grinds, making it a slightly better grinder in that regard, since it can more accurately brew for a variety of brewing methods. The remaining 3 of our 5 best grinders under $50 are all electric, so we shall bid farewell to coffee mills for now. 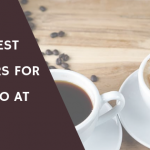 While most electric coffee grinders are not something that you will see at the World Barista Championships, there are many electric coffee grinders that are popular among coffee fans for a number of reasons, with the main reason being price. 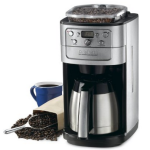 The price of many of these best selling electric coffee grinders, when combined with the value of the grinder itself, is practically unbeatable. With its compact size (roughly 4 x 4 x 8 ” and weighing in at a single pound) and retractable cord, the Hamilton Beach 80365 Custom Grind makes for a fairly unobtrusive addition to your kitchen. You can definitely tuck it away in a corner or cupboard when not in use, but at the same time, its not a bad looking device by any means, and is actually a bit of a conversation starter as non-coffee drinkers tend to look and it and not know exactly what it might be for. Here’s a quick video showing the Hamilton Beach 80365 Custom Grind in action. The Hamilton Beach definitely has done well here with its custom grind settings (hence the name “Custom Grind”), with a flexibility that seems to satisfy the majority of french press, drip coffee, and even espresso enthusiasts who have raved about the Hamilton Beach Custom Grind. 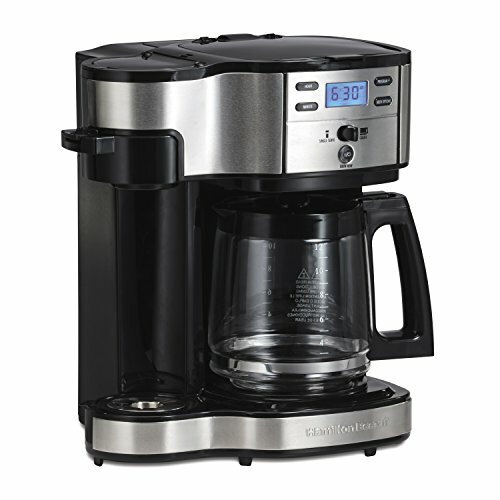 Depending where you buy, you can get the Hamilton Beach 80365 for less than $20, and, although it is not the technical marvel of, say, a Breville Smart Grinder (which is much more expensive), the way the Hamilton Beach 80365 is designed to provide some of the versatility of the more expensive coffee grinder models. With the one-touch grind feature, also known as “hands-free grinding”, the Hamilton Beach 80365 gives you the option of automating a lot of the work, saving you time, while also giving you what you want in terms of grind size. 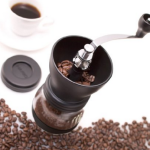 Based on what customers have been saying about this product, there may be a bit of experimenting needed at first in order to get exactly what you want from this grinder, but this also basically goes for any coffee grinder which gives you a number of adjustable settings to play with – usually the more expensive types. 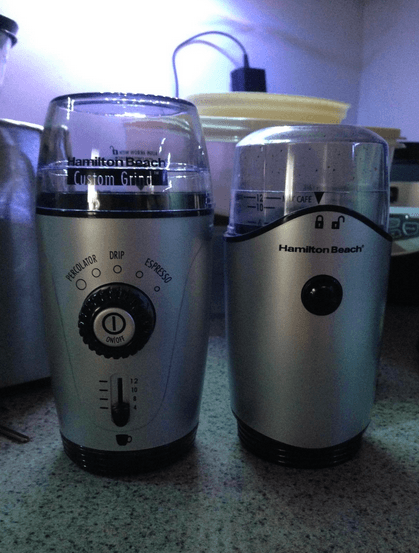 Luckily, the way the the controls are laid out here are very clear, and that is partly why we appreciate the Hamilton Beach 80365 – because of how simple everything is laid out. 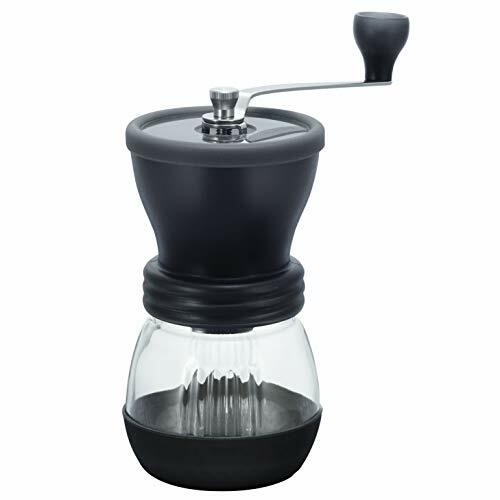 This coffee grinder is essentially the opposite in many ways to the Hario Manual and the Kuissential Manual coffee mills. 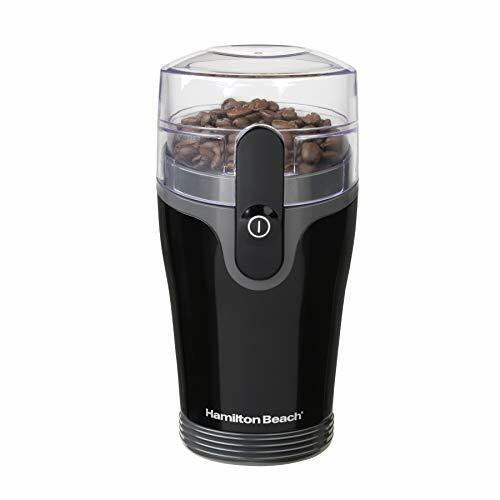 Whereas those grinders focus on grinding things manually and slowly (although they are adjustable as well), the Hamilton Beach can grind up to 12 cups of coffee worth of beans in just seconds, saving you precious time. 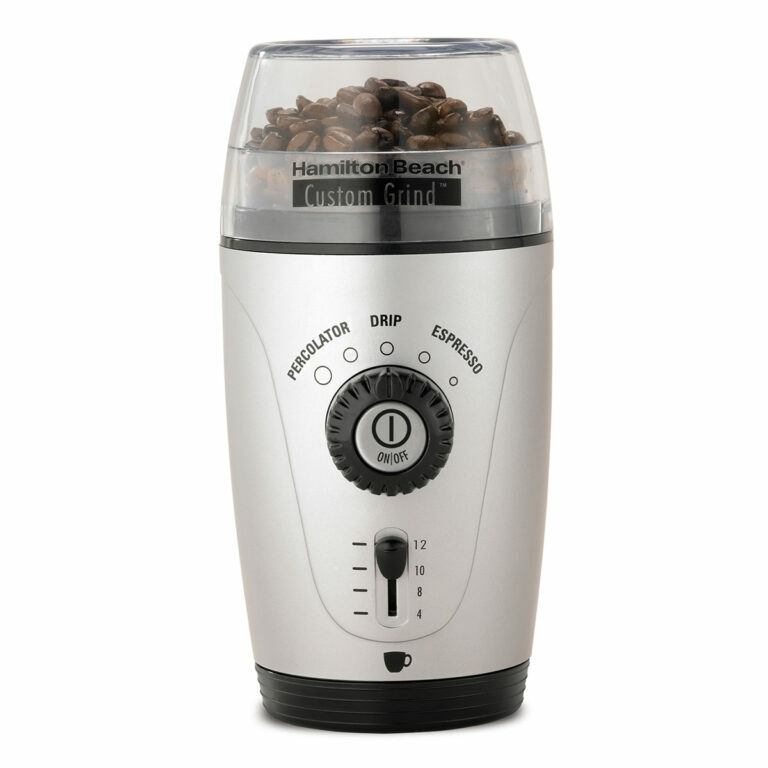 Some buyers of the Hamilton Beach 80365 have said that finer coffee grinds can get caught in the small parts of the mechanism, which means that with repeated use, you need to keep it as clean as possible to avoid tiny coffee particles from interfering with the internal workings of this grinder. 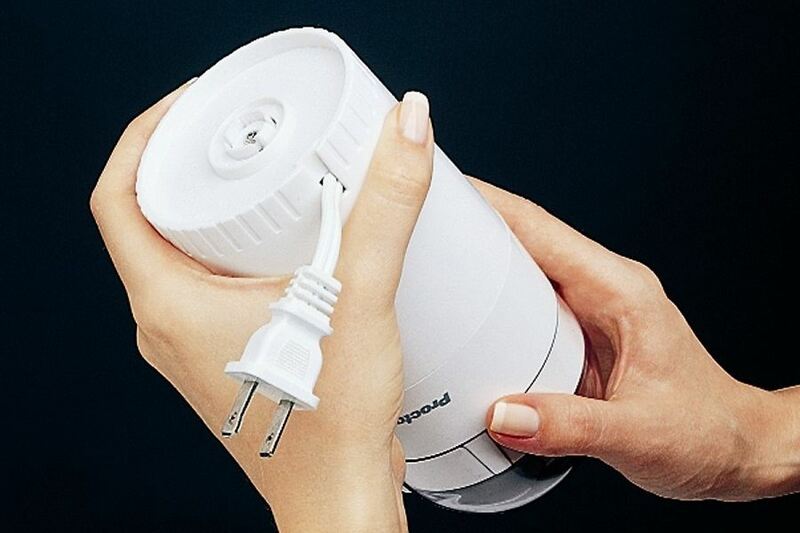 Keep this grinder clean by washing the washable parts and using a bit of pressurized air once in a while to clean out the nooks and crannies, and the Hamilton Beach 80365 is sure to serve you well for a long time to come. 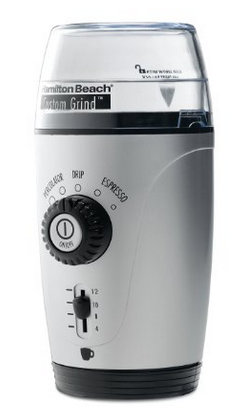 The Hamilton Beach 80365 Custom Grind comes with a cleaning brush which, although its just a little thing, does come in handy when it comes time to clean as this brush is small enough to really get in there and sweep out the nooks and crannies. Also, the Hamilton Beach 80365 makes a great spice grinder, so even if you get tired of grinding for coffee (is this possible? ), you can always use this machine for spice grinding, as it does quite well with most spices (even the harder ones such as cinnamon and flax seeds). 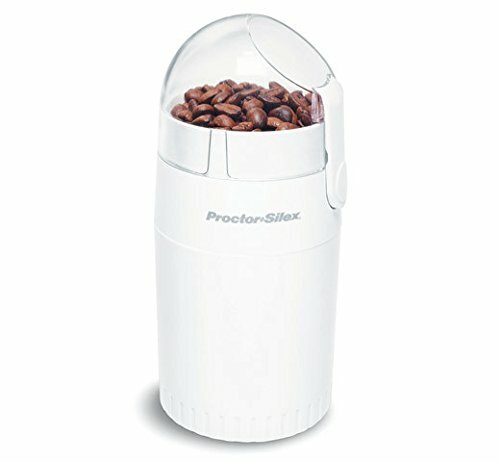 The Proctor-Silex E160BY Fresh Grind is the least expensive coffee grinder out of the 5 products we are reviewing here, and, considering the quality of this electric blade grinder, overall, you’re getting one of the best deals here, and you can often find this coffee grinder for under $15 if you shop smart. The Proctor-Silex E160BY, with its all white or all black exterior and domed plastic lid, is very practically put together, and not bad-looking at all as far as small kitchen appliances go. It has a retractable cord (just twist the unit itself to wind it up) and can grind for up to ten cups of coffee at once with its decently sized bean hopper. Another upside of the Proctor-Silex is that its really easy to empty out the grinds. You just turn it over, tap it a little bit, and the entire contents are released into your favorite coffee maker, pour over device (such as Aeropress or Chemex), or a vacuum-sealed grinds vault to use for later. The Proctor-Silex E160BY is also very easy to clean in this regard as well, with just the bean hopper area to keep clean and you’re good to go for another round of grinding. While grinding enough for 10 cups of coffee at once sounds like a fair amount of coffee, the next grinder we will be talking about does have a larger capacity and a similar price tag, so stick around for that if you want to get more grinds out of your grinder in one shot. 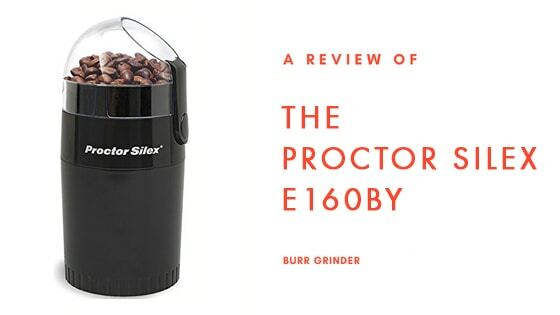 The grind button for the Proctor-Silex is conveniently found on the side of the unit, and it has a safety on/off feature which means that this grinder won’t work unless the lid is firmly attached. The fineness of the grind depends on how long you hold down the grind button, which is not going to win over any pro baristas, who would consider this a major drawback to getting the right grind consistency. All we can say is that for less than $15, the amount of money you save might ease the pain a little bit. The last think we should mention is there’s no plastic grip on the bottom here, so you have to make sure you don’t start grinding and have this machine do a dive onto your floor. This is not ideal, of course, but you get what you pay for. At the end of the day, the Proctor Silex E160BY is fast, efficient, and gets the job done. It may not be extremely fancy, or have a lot of features, but the bottom line here is that if you are after something super affordable that can grind coffee fast, you’ve found it! There are many reasons we love the KRUPS F203, and the first one we’ll talk about here is how it looks. With looks, its all a matter of preference, but we really think that for the money you spend on this little 3.5 x 3 x 6.8 inch, 1 pound coffee grinder, you’re getting a very nice looking, shall we say snazzy product. 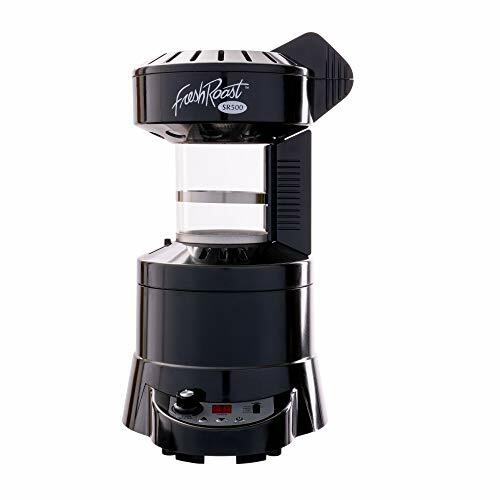 Most of the time, you can find this coffee grinder for under $20, and we think that this machine adds a touch of class to just about any kitchen style imaginable as it is black, and you can’t really go wrong with black. As for the shape, whereas the Proctor Silex has that grain silo shape to it, the KRUPS is a little more stylish with some sloping lines, curves, and a more oval shape to it. 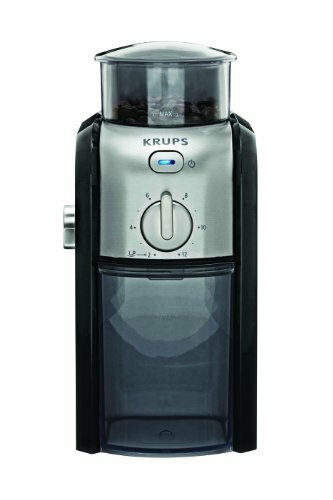 Specifically, the KRUPS F203 has a larger bean hopper than the previously mentioned Proctor Silex, with the capacity to grind for up to 12 cups of coffee instead of 10, so this is something which fans of the KRUPS F203 show their appreciation for. Still, it is not a large grinder by any means, measuring, as we said, only 6.8 inches tall. The 200 watt motor that the KRUPS F203 has beats the 70 watt motor of the Proctor Silex, giving it more power and a more consistent grind. 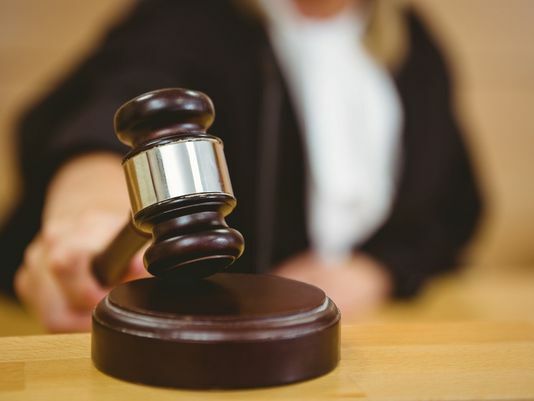 This, perhaps, also partly accounts for the difference in price, since it is usually tougher hardware that bumps up the price of nearly anything. 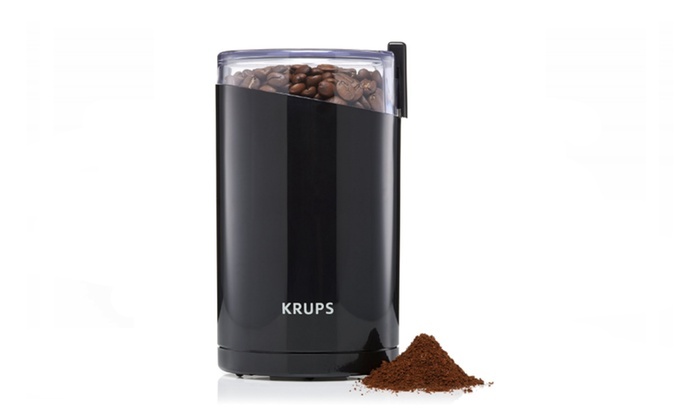 With this motor, it takes about ten seconds for the KRUPS to grind your beans to the desired consistency. Here’s a video of the KRUPS F203 to show it in action. Similar to the Proctor Silex, you simply turn over your KRUPS F203, give it a little tap or shake, and your coffee grinds should fall neatly into their destination, whether that’s a coffee filter, a French Press, or something else. 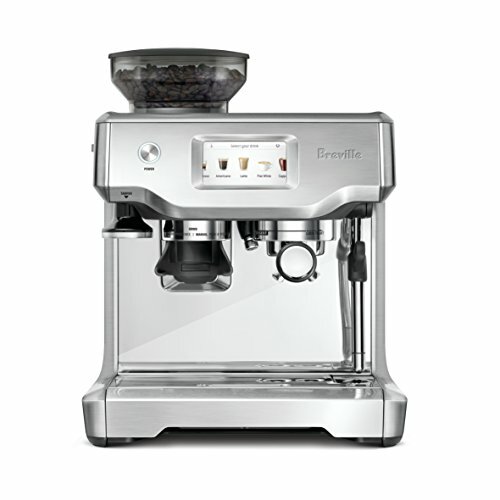 With the KRUPS F203, the grind button is on the top of the unit, whereas with the Proctor-Silex E160BY, the grind button is found on the side. With the button being on the top of the unit, it is simply easier to press. This isn’t a huge difference, maybe, but it is something that we like about the design of the KRUPS F203 a little better than the Proctor Silex. In addition, there is less chance of your KRUPS F203 shimmying off your counter just due to its overall shape and the fact that if you’re pressing down to grind, you don’t have to hold it as well. While the Proctor Silex is just a little more affordable overall, we think that the KRUPS F203 has the looks , the functionality (grinds spices also), the bean hopper size, and the overall usability that really warrants the huge amount of praise its gotten. Highly recommended!